Like most subjects, bolted joint development contains a number of important considerations, some of which are often overlooked. 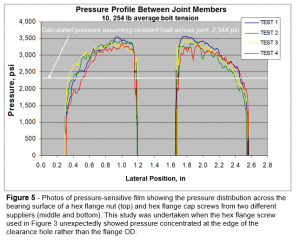 While estimating the bolt tension achieved for a given tightening strategy is certainly a common focus, the effect that load has on the joint components is less fully discussed and understood. One of the reasons threaded fasteners are so widely used is that they can generate a tremendous amount of clamp load in a small area. For example a ½ – 20 Grade 8 bolt can supply nearly 20,000 lb of clamp load in little more than a one inch diameter. Clamp load is central because it is the mechanism by which joint components can be held together without moving relative to one another – arguably the primary requirement of a structural joint. However, placing a large load on a small area creates a high level of stress, which in turn can lead to problems. A common analogy is the effect spike heels can have on wood floors. While technically accurate, experience shows that use of an alternative comparison is better for one’s health. 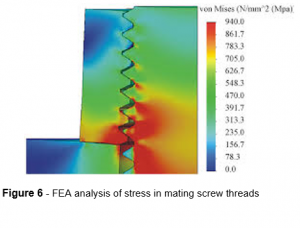 This article will examine the impact of bolt tension on the two opposing areas over which that load is reacted – under the head or nut and in the mating threads. 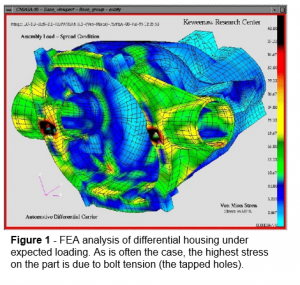 For example, Figure 1 shows the FEA analysis of an automotive differential housing. In what is a common occurrence, the highest stresses act on the threaded holes. Being focused exclusively on assisting clients with the development, testing and validation of bolted joints, Peak Innovations Engineering has found that an effective means of explaining joint behavior is to give examples of the effect of common design decisions. Test experience also provides insight into where actual results tend to differ significantly from calculations. With the exception of not testing to determine bolt tension and the resulting clamp load, exceeding the compressive yield strength of the material under the head or nut is arguably the most common deviation from recommended design practice. The most common target for bolt tightening is to achieve 75 % of the bolt’s proof load. Using a ½-13 hex head cap screw for illustration, Figure 2 summarizes the pressure that would be generated by that bolt tension on the mating material assuming a standard 9/16” clearance hole. It then compares that pressure to the estimated compressive yield strength of common steel clamp members with a range of hardness. Note that compressive yield strength is rarely specified, but tensile yield strength is a commonly accepted estimate for some common materials such as steel, though not others (notably all types of cast iron). To show how relatively small dimensional changes can have great impact on area, the same calculation is performed for a flange head screw. Use of flat washers is not included because the calculation would be dependent on the relative hardness of the washer, clamped member and fastener, as well as the ID/OD of the washer chosen. The take-away from Figure 2 appears to be that as long as Grade 8 fasteners aren’t used on materials softer than the Rockwall C scale, the area under hex head fasteners is sufficient. Unfortunately the actual pressure is highly uneven, and contact area is often less than predicted due to uneven surfaces. Therefore the maximum pressure actually present is much higher than the theoretical average value. Figure 3 shows scanned images of pressure sensitive film placed directly under the head of a hex cap screw and under a combination hex cap screw head and flat washer. The standard washer’s thickness is not nearly great enough to react loads evenly across its diameter. Note that a hardened washer of the same dimensions would behave the same way. Of course there are other reasons for the use of flat washers other than to spread bolt loads, such as providing a constant friction coefficient against varying clamps materials and finishes, elimination of galling or stick-slip, and to protect the integrity of the underlying finish. 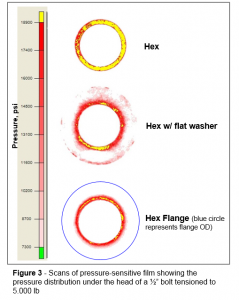 While flange heads are stiffer than standard flat washers, a different variable is to be considered. The contact face is not perfectly flat, but instead generally slightly conical. This creates a different type of pressure gradient across the diameter, and one that is more difficult to predict. 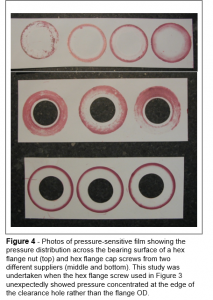 This is illustrated in Figure 4 showing photos of pressure sensitive film studies of flange nuts and screws. This review of ½” and M12 flange hardware was undertaken when a customer test revealed a flange head screw with a convex surface (contact at the edge of the clearance hole). An example is shown in the bottom image of Figure 3. In addition to increasing surface area, increasing the contact diameter of the fastener on which torque is applied increases the average radius on which resistance due to frictions acts. This reduces the bolt tension generated for a given torque. In this case the tension reduction of substituting flange head for hex head fasteners is approximately 12%. Figure 5 extends this example of uneven clamp load by showing the pressure distribution across two 2.25” dia. x 2 “ long cylinders clamped by a ½”-13 screw and nut. Even at this thickness the peak pressure is still 40% greater than would be predicted by dividing the bolt tension by the contact area at the joint faces. * Joints that combine high axial loads and bolts with small length-to-diameter ratios. In joints where compressive yield is imminent, the additional bolt load can be great enough to create much greater clamp load loss than the relaxation which regularly occurs due to localized yield immediately after tightening. * Joints operating at temperatures significantly different that those at which tightening occurred that also have clamped members with different rates of thermal expansion than the bolts. A common example is engine bolts in aluminum castings. At operating temperature the greater expansion of the aluminum castings can results in clamp load loss through either embedment, bolt yield or thread yield. leveling of individual thread stress. This is how additional threads are engaged. To a lesser degree this effect is present in standard nuts properly matched with the mating screw. Nuts are specified to have slightly lower yield strength that the matched screw to take advantage of this effect. It is important to note that this doesn’t mean the nut is the weaker of the two elements, as its height is established so that there is enough thread area that the bolt will fracture before the nut threads suffer noticeable damage. The width or diameter of the nut also plays a part in its load capacity. Figure 6 shows the nut threads expanding away from the screw as mating threads slide relative to one another radially. This reduction in thread engagement, and therefore load capacity, is a function of the nut member’s stiffness in the radial direction. Width across the flats of standard nuts is about 1.5 to 1.6 to times the nominal thread diameter. This is actually a compromise between strength and size as a ratio of nearly 2:1 is required to eliminate dilation. Nuts are available in larger widths and lengths when required. A much more isolated, but related effect are specialty nuts, such as those used in aerospace, which have a thick flange to minimize dilation, but have a thin wall above the flange to save weight. This often results in axial compression of the nut body prior to bolt yield. * The incomplete threads at the screw tip in blind holes. This can reduce capacity by 20% in hard materials that require only short thread engagement. * The chamfer added to the hole entry after tapping. This is often incorrectly included in thread engagement. Because it is often not seen as an important dimension, and is difficult to measure accurately, this feature is often not well controlled. As with incomplete threads, the impact is greater the smaller the L/D ratio. 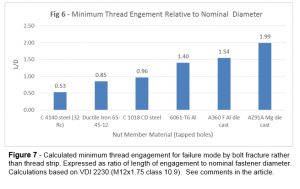 * Because the radial dimensions of thread engagement are quite small, small dimensional changes in either internal or external threads can have a measurable impact on load capacity. For example, if all the dimensional and material tolerances on standard threads are at a worst-case condition, failure mode can change bolt fracture to thread strip. 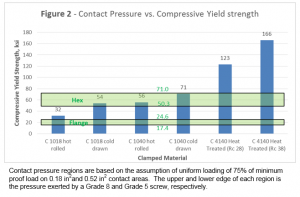 Dimensional variation is more common in tapped holes, particularly by those produced by lower volume production methods, than in standard fasteners. In summary, the high stresses produced in bolted joints magnify the effect of “theory vs. reality”. While increasingly powerful analytical tools reduce development time and cost, physical testing of bolted joints is essential in avoiding costly failures.